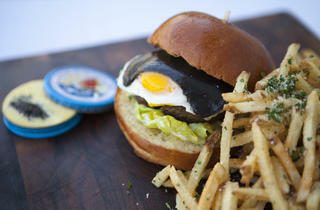 Photograph: Jakob N. LaymanWhere: PetrossianWhat: Caviar Burger ($75) West Hollywood's caviar king may be known for its highly refined fare, but executive chef Giselle Wellman is cranking out a burger fit for a spot on Lifestyles of the Rich and Famous. 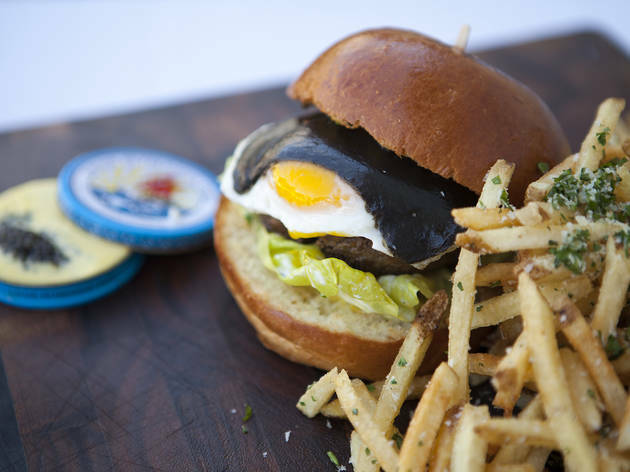 The Caviar Burger comes topped with butter lettuce, a fried egg, cr&egrave;me fra&iacute;che dressing and the crown jewel: a sheet of Petrossian's pressed caviar. Try ordering that at McDonald's. 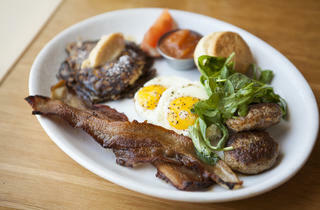 Photograph: Jakob N. LaymanWhere: Salt's CureWhat: All-Star ($15) The 2x2x2 is your classic eggs/bacon/sausage deal found at most breakfast spots. 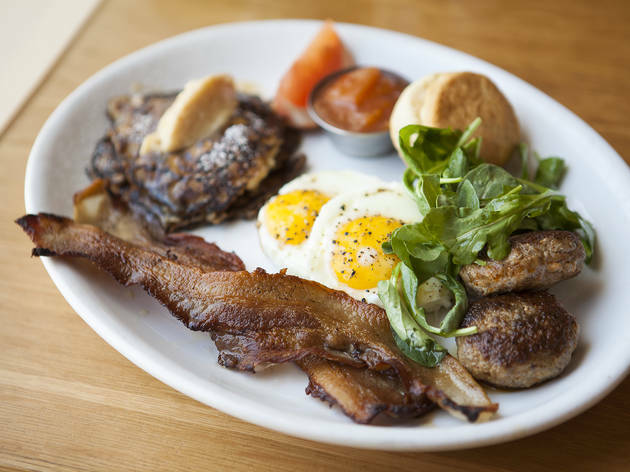 Salt's Cure makes it their own with house-cured bacon, homemade sausage and a biscuit that's also&mdash;you guessed it&mdash;made in-house. Off-menu aficionados, however, know to ask for the All-Star, which adds onto the 2x2x2 with silver dollar oatcakes&mdash;you may not need to eat anything else for the rest of the day. 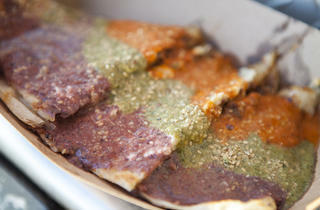 Photograph: Jakob N. LaymanWhere: KogiWhat: Pacman Quesadilla ($7) No, this off-the-menu item doesn't take its name from the '90s arcade game, but rather from Manny Pacquiao. Why? 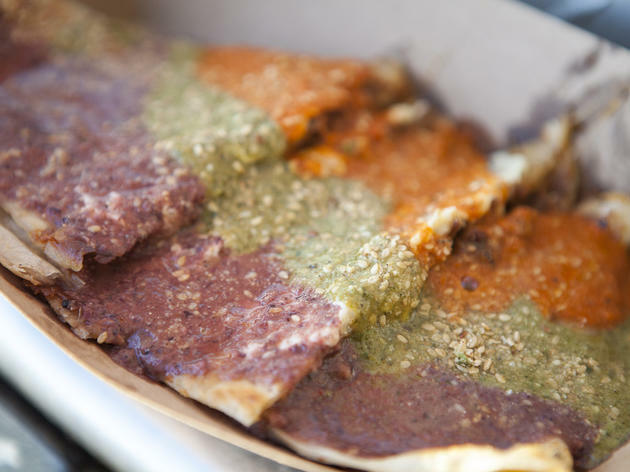 The everything-but-the-kitchen-sink quesadilla is stuffed with the works&mdash;a trio of meats (short, spicy pork, chicken) and salsas (roja, verde, az&uacute;l), Jack and cheddar cheeses and sesame mayo&mdash;for a knock-out punch. 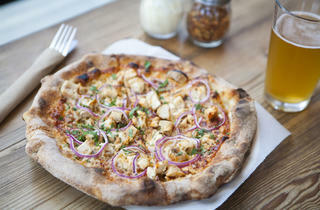 Photograph: Jakob N. LaymanWhere: Pitfire PizzaWhat: BBQ chicken pizza ($10) Pitfire has exploded into a mini-chain across the Southland, but this hush-hush pizza takes its cue from the original California pizza chain (or, more accurately, kitchen). 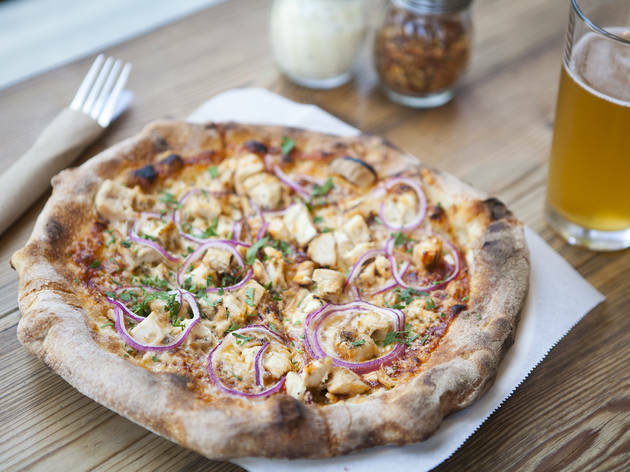 Grilled chicken, red onion and cilantro get covered in a blanket of four cheeses (Parmesan, Gouda, mozzarella and Fontina), while a layer of barbeque sauce underneath provides the requisite tang. Want to load up on more carbs? Their off-menu breadsticks are worth telling everyone about. 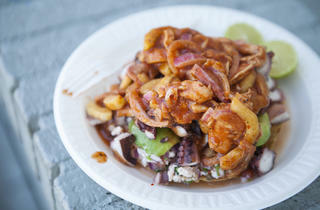 Photograph: Jakob N. LaymanWhere: Mariscos JaliscoWhat: The Poseidon ($7.50) Bored cooks with full kitchens can dream up some amazing off-menu items and that's exactly what happened at this East LA taco truck where you can find the Poseidon&mdash;the seafood feast is named for Tepo, the man who created the four-layer tostada with shrimp ceviche, sliced avocado, octopus and a mound of red, spicy shrimp aguachile. You may want to recruit the Greek god himself to help you finish it. 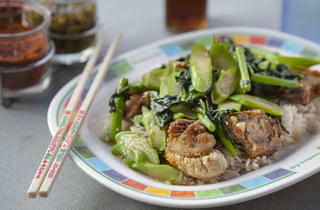 Photograph: Jakob N. LaymanWhere: Sanamluang What: Khana moo grob ($6.95) Impress your friends with your insider knowledge that's sure to earn you some foodie street cred. And the word on these Thai Town streets? 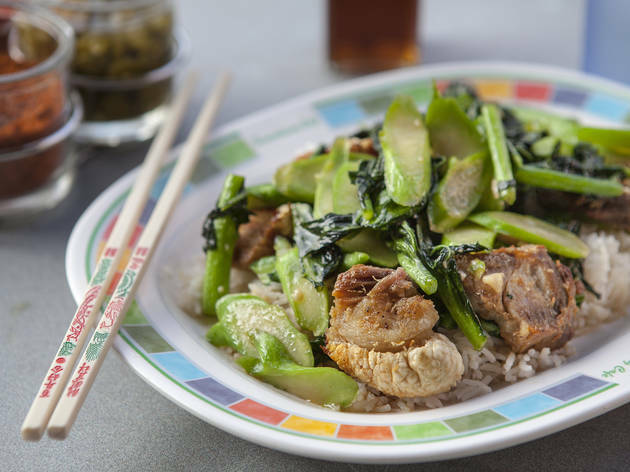 Take an off-menu detour with crispy, fried pork belly and Chinese broccoli served with addictive garlic sauce atop rice. 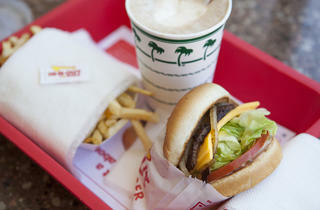 Photograph: Jakob N. LaymanWhere: In-N-OutWhat: Toppings (whole grilled onion, chopped chiles, cold cheese) + root beer float The Secret Menu at In-N-Out is so well-known that there's a section on their website called &ldquo;Not-So-Secret Menu." The truth, though, is that there are secrets far beyond your standard Flying Dutchman and Animal-Style Fries. Did you know that you can eschew those tiny chopped grilled onions for a whole slice of grilled onion? How about throwing super spicy chopped chiles on your burger? 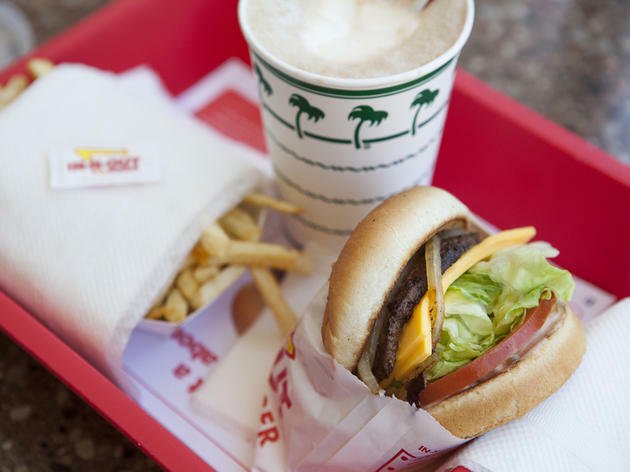 Maybe you even prefer the taste of unmelted cheese&mdash;you can asked for &ldquo;cold cheese?&rdquo; All of these secret toppings are possible at your local In-N-Out, and you can wash it down with an off-menu root beer float ($2.05). 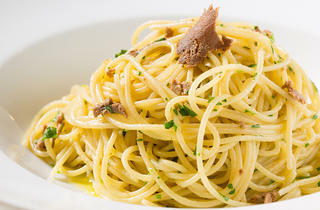 Photograph: Victor LeungWhere: CelestinoWhat: Spaghetti alla bottarga ($26) &nbsp; The darling Italian restaurant in Pasadena already has a roster of fantastic pasta dishes, but for something a little more unique, order the spaghetti alla bottarga. 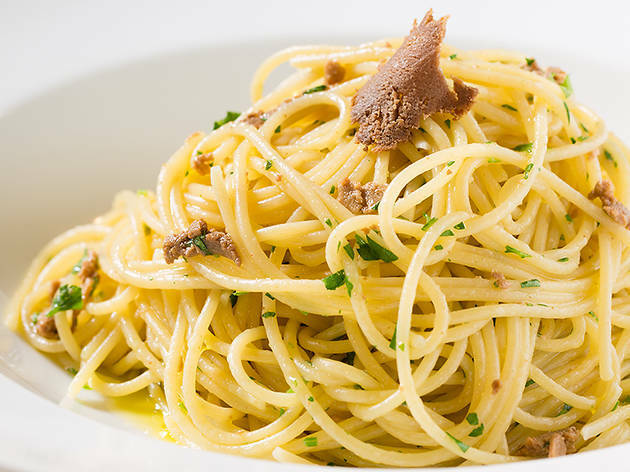 Just be warned that bottarga is a love-it-or-hate-it ingredient. Pungent and strong, bottarga is salted fish roe; at Celestino, the fish of choice is tuna. Dried out and shredded over spaghetti with a drizzle of olive oil and breadcrumbs, it's a meal that will leave your taste buds singing. 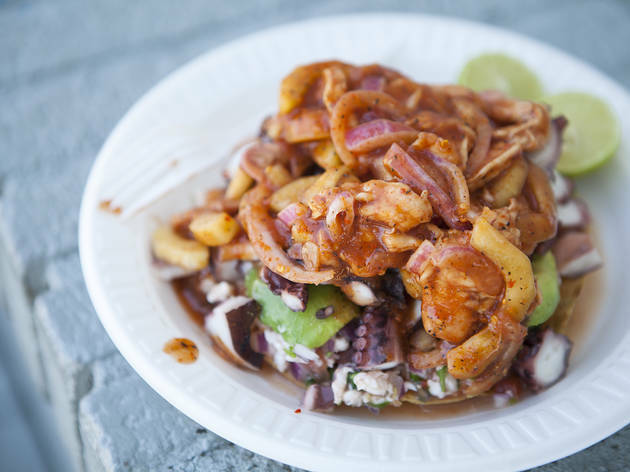 Photograph: Jakob N. LaymanWhere: JitladaWhat: Jazz Burger ($17.95) &nbsp; Uttering the name "Jitlada" produces a visceral reaction in most Angelenos; namely, grabbing their throats as they breathe mock fire. 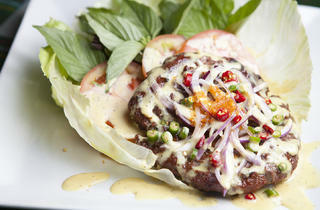 The Thai restaurant on Sunset is known for its extremely spicy dishes, but an off-menu item, the Jazz Burger, is on the tamer side. 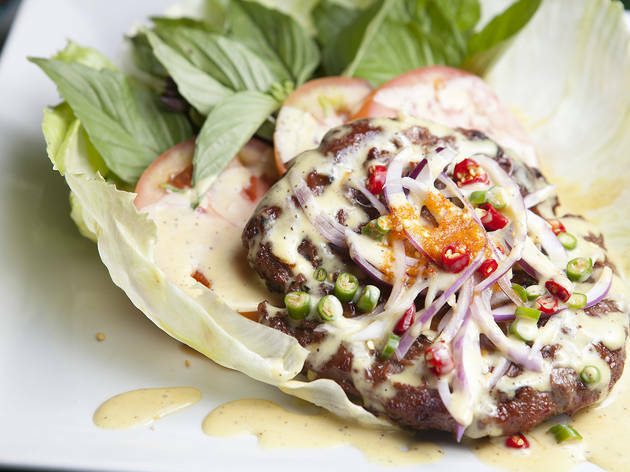 Created by owner Jazz Singnasong, the dish features two beef patties caramelized with garlic and palm sugar; topped with onions, mustard, herbs and tomatoes; and wrapped up in a swath of lettuce. 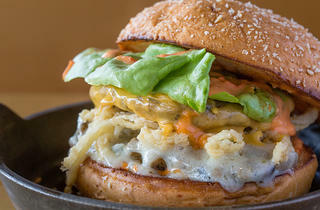 Photograph: Victor LeungWhere: Plan CheckWhat: Veggie Burger Double Up ($11.50) &nbsp; Vegetarians walking into any one of Plan Check's three locations (Sawtelle, Fairfax, Downtown) may at first see little in the way of veg-fare on the menu. But the Veggie Burger Double Up, an off-menu item, is a goldmine. 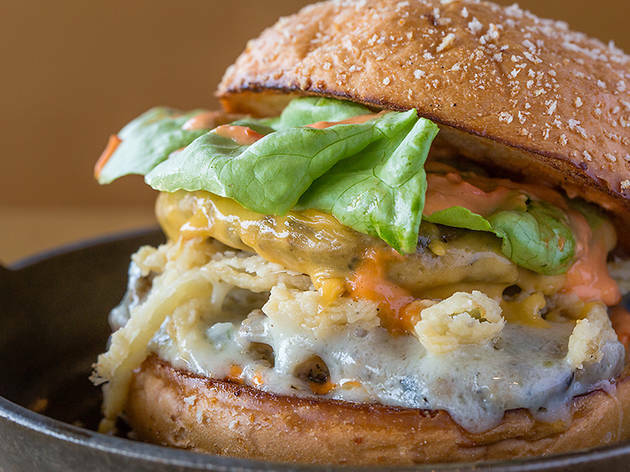 Two housemade veggie patties are covered in Swiss and American cheese, onion strings, butter lettuce and tomato mayo, and sandwiched between Plan Check's signature crunchy bun. Who needs their fried chicken anyway? 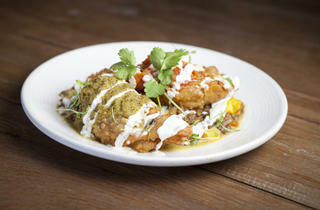 Photograph: Jakob N. LaymanWhere: Gracias MadreWhat: Winter empa&ntilde;adas ($8) &nbsp; What started as a dish on Gracias Madre's dineLA tasting menu has evolved into an off-menu order, back by popular demand after dineLA ended and fans of the vegan Mexican restaurant wondered where the hell those winter empanadas went. 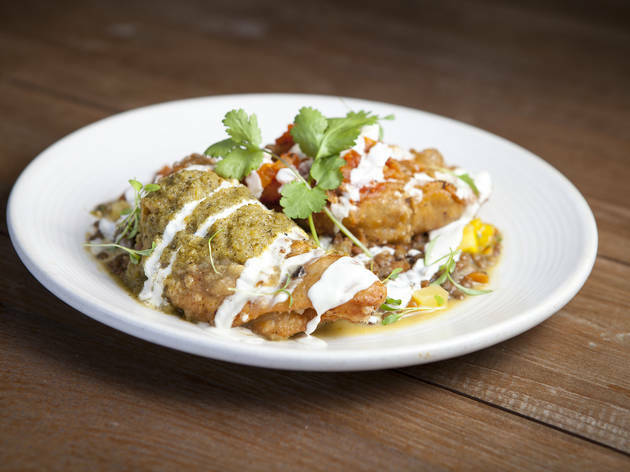 Chef Chandra Gilbert fills the plate with roasted root vegetables, kale, tomato habanero jam, cilantro tamarind chutney and cumin lentil&mdash;all you have to do is ask. 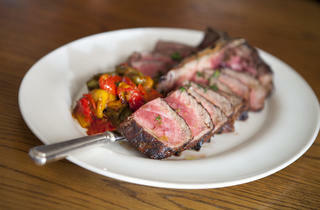 Photograph: Jakob N. LaymanWhere: Cecconi'sWhat: Steak (prices vary) &nbsp; Sure, this West Hollywood power spot might be all about Italian classics, but inquire about the "secret" steak and you'll be rewarded with a cut of high-quality, grass-fed beef from BN Ranch. 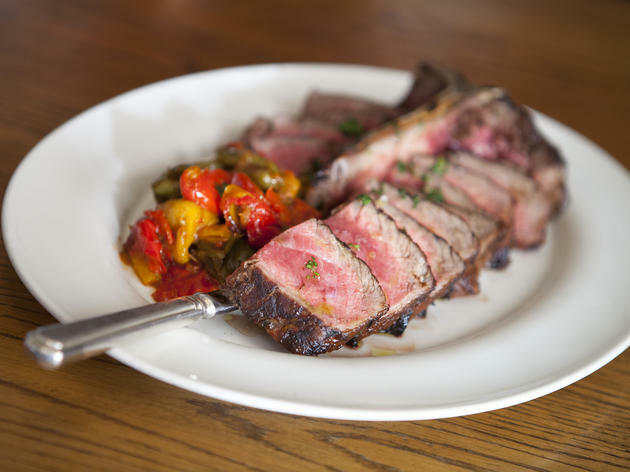 The accompanying sides vary depending on the season&mdash;potatoes with peperonata and a creamy morel sauce, perhaps; or maybe kale salad with shaved artichokes, parmesan and a porcini mushroom sauce. Perfetto! 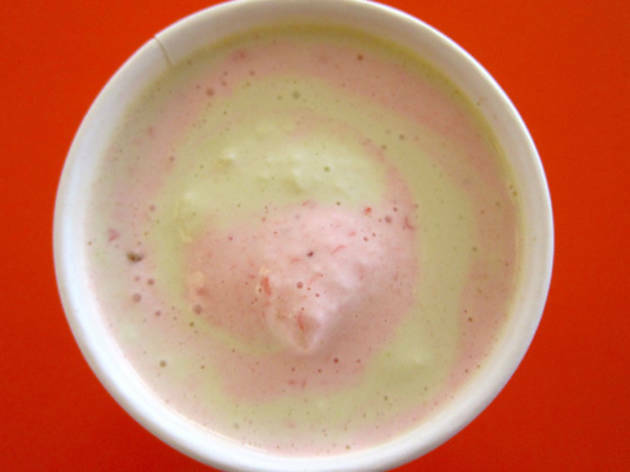 Photo courtesy Top RoundWhere: Top RoundWhat: Pistachio and Strawberry Concrete Combo ($2.95, small; $3.95, large) Top Round opened just in time for summer. With a full roster of Arby's-esque roast beef sandwiches and a frozen custard bar, any native of St. Louis would weep with tears of joy. While you can get classic toppings like hot fudge, peanuts and marshmallows, those in-the-know (i.e. 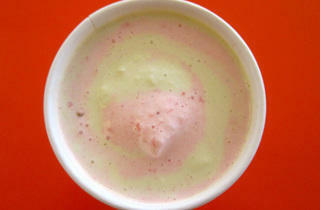 you) can order the pistachio and strawberry swirl&mdash;both flavors mix into a summertime color tribute to Christmas. LA has its fair share of not-so-secret menus (read: animal-style everything at In-N-Out) that might satisfy out-of-towners and tourists, but that's child's play to Angelenos. We want the real inside scoop, the vegetarian alternatives and the secret pastrami fries that aren't so obvious. From pistachio milkshakes to a burger fit for royalty, here are the best secret menu items around town.